A total lunar eclipse occurred on January 31, 2018. The Moon was near its perigee on January 30 and so may be described as a “supermoon”. The previous supermoon lunar eclipse was in September 2015. As it was also a blue moon, the second full moon in the calendar month of January 2018, it was referred to as a “super blue blood moon”; the term blood refers to the typical color of the Moon during a total lunar eclipse. This coincidence last occurred on December 30, 1982 for the eastern hemisphere, and otherwise before that on March 31, 1866. The next occurrence will be on January 31, 2037, one metonic cycle (19 years) later. This was a “supermoon”, as the Moon was near to its closest distance to earth in its elliptical orbit, making it 7% larger in diameter or 14% larger in area, than an average full moon. The previous supermoon lunar eclipse was the September 2015 lunar eclipse. The full moon of 31 January 2018 was the second full moon that calendar month (in most time zones), making it, under one definition of the term, a “blue moon”. 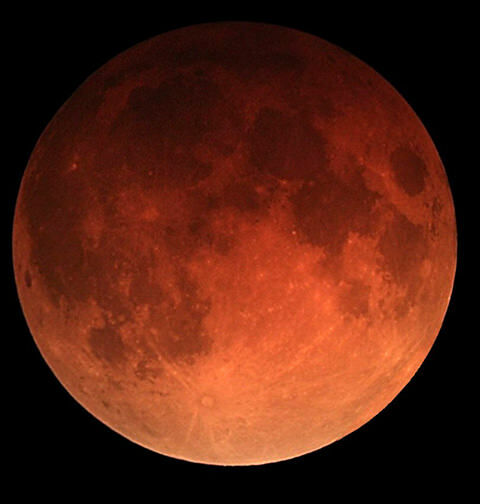 Additionally referencing the orange or red “blood” colors that occur during a lunar eclipse, media sources described the event as a “super blue blood Moon”.